Afghan rescuers are searching for dozens of people believed to be trapped under snow after a series of deadly avalanches north of the capital, Kabul. Officials said at least 187 people had been killed and 129 injured after homes were deluged in Panjshir province. Avalanches in other areas have also caused deaths, including 14 members of the same family in Nuristan province. Officials said the avalanches and sudden snowfall were the worst in decades, and took locals by surprise. Although avalanches are quite common, this year's disaster is the most deadly in years. Some 20 avalanches hit the Salang area in 2010, killing at least 165. Many younger people tend to leave the Panjshir valley to find work in Kabul. They live in the capital, but may have houses in the valley that they visit occasionally, especially in the summer. It is the poorer, rural population who would be resident during the cold winter months. They tend to be farmers who are used to dealing with harsh winters, when roads are often blocked and their communities can be cut off. It is these people - about 60,000 of them - who are the most vulnerable to this kind of disaster, particularly because they live in mud-brick houses that are not designed to withstand such forces. 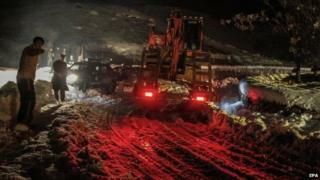 Civilians and rescue teams were having to battle through snow-blocked roads to try to reach remote areas. Funerals for the victims in Panjshir province, usually held within hours of death, have been delayed because of the snow. Afghan cricket officials dedicated their first ever world cup victory to the victims of the avalanches. Other parts of Afghanistan have also been battling severe weather. In the far north-eastern province of Badakhshan, at least 11 people died in avalanches, officials told the BBC. And in Nuristan, officials said an avalanche buried a house, killing 14 members of the same family. Four bodies had been recovered, and emergency teams were trying to dig out the other 10.